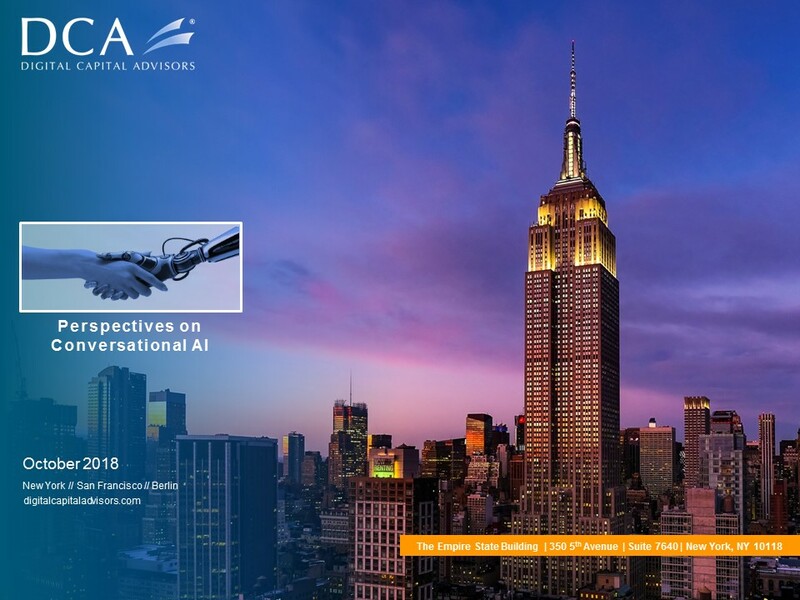 October 16th, 2018 - Digital Capital Advisors is pleased to release our latest sector deck, Perspectives on Conversational AI. Since the introduction of machine learning in the 1980s, conversational AI has been seen as the future of human computer interaction. Natural language processing, a subset of AI, has benefited from the ever expanding quantity of natural language data driven by the rise of conversational interfaces, yielding greater language recognition, understanding and generation capabilities. With 23% of millennials using voice-enables digital assistants monthly, Conversational AI is here to stay. Major players such as Google, Facebook, Apple and Amazon are constantly advancing their conversational interfaces and physical product suite, innovating new natural language processing capabilities and use cases. However, similar to AI holistically, barriers still remain for conversational AI. The proliferation of bias data sets, continued AI talent shortages and inflated consumer and corporate expectations, leave room for continued growth and development. Digital Capital Advisor's report analyses the headwinds and tailwinds, highlights the development of Conversational AI over time, delves into consumer and corporate use cases, and discusses the possibilities for this exciting and pivotal sector in the future. Please submit a request below to receive your copy of Perspectives on Conversational AI.